The town of Bottleneck has a real problem. The town is under the thumb of saloon owner Kent and dirty deals and underhandedness are running rampant. 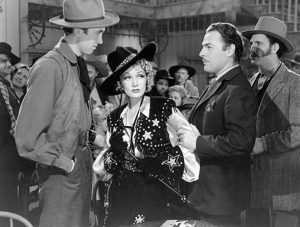 He and his crooked gal Frenchy (Marlene Dietrich) are living the good life while the kind folk and now they look to have their sights set on taking advantage of the local cattle ranchers and making their life terrible. When the town sheriff looks about to cause a ruckus trying to stop the dirty dealing Kent has him killed. Bottleneck’s mayor, who is in cahoots with Kent, appoints a new town sheriff – the town drunk Washington Dimsdale (Charles Winninger). His appointment should guarantee the law from causing any more problems getting in the way of their schemes. However, Dimsdale takes his appointment seriously and really wants to clean up Bottleneck. He calls on the son of famed lawman Tom Destry to help him out. 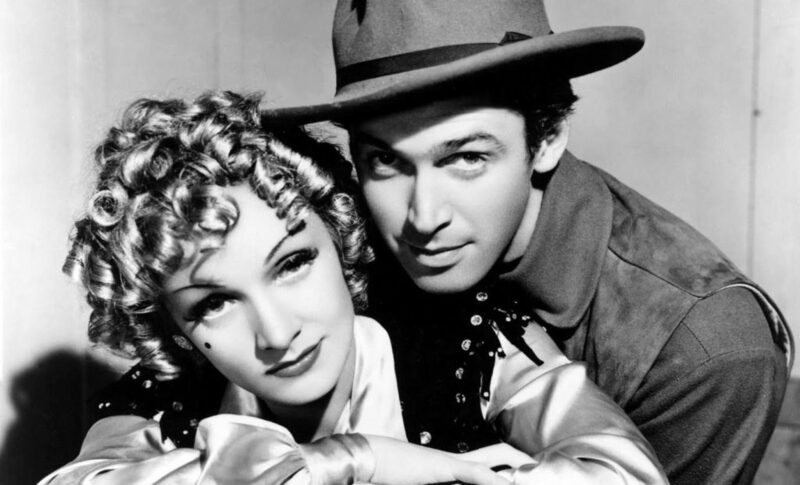 Tom Destry Jr. (James Stewart) arrives and he’s a very different lawman than his father was. He looks more like a tenderfoot than a dangerous gunman! But he’ll soon earn the towns respect, make Frenchy see her wrongs and clean up Bottleneck once and for all! And no, despite the title sounding like it’s a sequel, it’s not. The story of Destry Rides Agains was made into a few films, which I never saw any of the other versions. Somehow I don’t think any can top this one. Destry Rides Again is a real crowd pleaser. Whenever I watch it I think back to how audiences must have reacted to it in 1939. They must have loved this! It was the age of western heroes on the silver screen and Destry must have really stood out. I sometimes think of it as being comparable as the same breath of fresh air that Die Hard gave action fans in 1988. Suddenly audiences got to see a new type of unconventional western hero. The handsome barrel chested, six-shooter, tough guy persona riding in on a horse was replaced by a tall thin fella moseying down the dusty street without any gun on his belt, stuttering and being the friendliest, most polite guy you could hope to meet. He’s ready to win the day using more brains than brawn. It must have been a dramatic change for western fans to witness. And Stewart is great starring in his first western. It was a perfect role for him early in his career. It wouldn’t be for another decade he put his cowboy hat back on and made an incredible run of more complex western characters with director Anthony Mann. Destry is such a refreshing hero who at first appears so out of place in this roughneck town. He doesn’t seem bothered by or intimidated by any of the mocking or apprehension he’s greeted with. And that’s why you want to root for this guy! Plus, he’s played by Jimmy. Marlene belts out a few tunes. Fans of Blazing Saddles will instantly see the inspiration for Madeline Khan’s performance here. I haven’t seen many of Dietrich’s films, but the one thing I always associate with her are the song lyrics “see what the boys in the backroom will have”. And she does it right here. She’s good and there’s some surprising chemistry between her tough gal singer and Stewart’s ‘aw shucks’ lawman. I guess it shouldn’t be much of a surprise since apparently the two had a bit of an affair during filming. But when she sees red and starts hauling bottles, chairs and guitars at Stewart it looks like serious harm will come to him! Seriously, there must have been little rehearsal during that scene since Stewart looks like he could catch a deadly blow at any moment. And somehow he acts as cool and relaxed as can be. It just makes me like this Destry fellow even more. 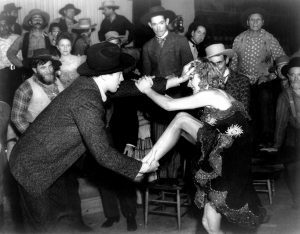 The film has a bit of fun with a lot of standard western conventions (the hero coming to clean up the town, the bar room brawl, the sweet matron, the tough saloon gal, the climactic shoot out) and manages to freshen them up. It also manages to balance the comedic slant of the story with a heartfelt tale between these two main characters. It has great performances all around. Director George Marshall keeps the pace up and manages to create genuine funny moments mixed in with sad, romantic and exciting ones. It’s amazing how well the film holds up all these years later.